Google Tag Manager v2 allows website owners to easily track button clicks by setting up a tag to pull data in Google Analytics. You can easily complete this in less than 10 minutes, 5 if you are fast 🙂 Follow the instruction below. To learn Google Tage Manager quickly, check out Google Tag Manager for Beginners Plus. In order for us to track button clicks we must trigger this event so that this data can be passed to Google Analytics. We know that we want to track button clicks but we don’t know the the data markup that defines that each specific button click. Identify the HTML markup of the button click by using the GTM preview to view the variables that define your click. You will need to refresh the page and then click the button. 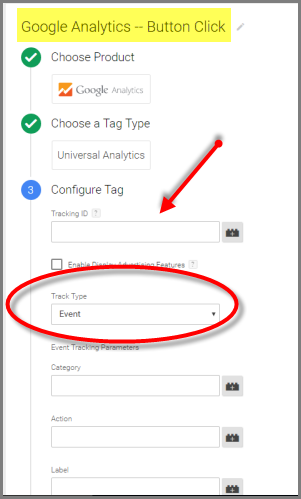 In the event summary find the gtmclick event Reveal it’s variables by clicking the variable tab. We can use the information to transform the generic click trigger into a specific trigger. For example the click class associated with the trigger is “search-button”. Use this information to redefine the click trigger. Choose the Generic Click Trigger. Change to Fire on Some Clicks. Choose Click Classes and within containing add “the button name. In this case, I’m using the name “search_button”. Name The Category, Action and Label. For the Fire On rule, choose the More option and choose your defined click trigger. Lastly open your Google Tag Manager preview mode and test the tag. After click the button, you will see that the tag is firing currently. For a quality check you to view whether this information is being pulled into the Google Analytics events. We check the real time events to see if the data can be tracked in analytics. In order to see whether the button tracking is working correctly, you will need to check your analytics account to ensure that the data has been based correctly via the tag. To this you can look into the event section to discover if the button click can be found in the real time data events.